Scaling (where it scales programs to various sizes) i.e. automatic scaling as you drag programs from one display to another, some programs ‘jump’ in size and most of the time the end result is the programs being blurry. Also some programs like PowerPoint and Skype for Business didn’t auto-scale correctly so would normally look massive on an external display as they would be scaled still at 200% on a not so high resolution display in comparison to the high resolution of the Surface. The following is speaking from my own vast painful and real life experience in this area. Let me make myself very clear as best as I can describe it, resolution is the amount of pixels. Back in the day the default was 1024×768, now it goes up to 4K, in other words 4000×3500 (for example). The higher the resolution, smaller (but sharper/crisper) programs look on the screen, which is why Windows does scaling at certain percentages to combat the small programs e.g. 125%, 150%, 175% or 200% scaling. The higher the resolution and the smaller the display size, the smaller the programs will look, why on a Surface Pro 4 with a maximum resolution of 2736 x 1824 pixels and 12.3 inch screen size, the default scaling is 200%. Also point to note, scaling at 200% means the computer puts an even 2x the amount of pixels per pixel in theory making everything look twice the size while remaining clear and crisp. Scaling at an uneven percentage e.g. 125% is sometimes a bit blurry, as you have one and a bit pixels and that ‘bit’ of a pixel causes blurriness. In saying all of this, to get a good external monitor that will work well with the Surface, you would need a monitor that would match the same default scaling size of the Surface primary display of 200%. You would need a larger physical size display with the same or higher resolution of the Surface. Enter 4K monitors, the Surface Pro 4 is capable of driving an external display 4K, but only through the mini-display port either directly on the Surface itself or on the Surface dock. You will need a mini-display to display port cable for this to work. 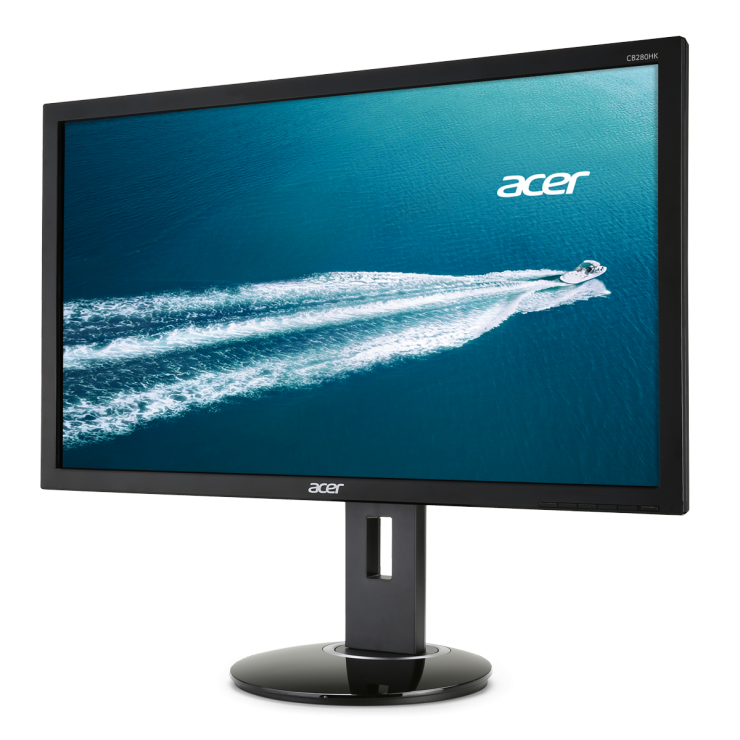 The best and most cost effective monitor that I use that fits the bill as the perfect companion to the Surface Pro 4 is an Acer CB280HK, it’s 28 inch, 4K with a resolution 3840 x 2216. For Surface Book users out there, there’s a quirk, apparently there’s a hardware design flaw with the Surface Book in that if you have your power cable plugged in, you can’t use the mini-display port on the Surface itself, as there’s not enough room to plug the mini-display cable into the port, its blocked by the power plug. Reason why I am saying this is when it comes to driving two 4K monitors from the Surface, you need the Surface dock – but!!!!! Yes, but, there’s a BIG but, you can’t drive two 4K monitors at the normal 60Hz from the two mini-display ports on the Surface dock as it reduces it to only 30Hz, it won’t work at 60Hz. To have two 4K monitors hanging off the Surface, you need to plug one into the Surface’s mini-display port itself and the other 4K monitor into one of the Surface Dock mini-display ports – this will give you two 4K monitors at 60Hz. Ok for Surface Pro users, not for Surface Book users – see here for more information. Thanks for info, i have been searching desperately for a monitor for my Surface Pro 4 without success. Resolution lousy etc. But the 28 inch ACER is simply too big for my needs. Would you be able to point me to a “second best” monitor (or HD TV screen) that has the same resolution, or nearly so, but is no bigger than 19 or 20 inches?